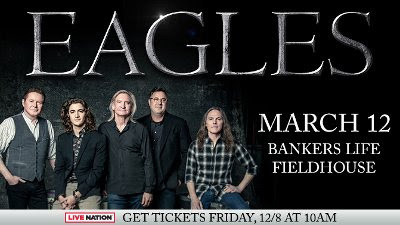 The tour that nobody thought would happen with the Eagles opened on Monday (March 12) night in Indianapolis. When Glenn Frey died in January of 2016, the general consensus was that the Eagles were done. Members of the band played the Grammys that year with Jackson Browne in salute to Frey but, in July of last year, they came out of their hiatus with new members Deacon Frey (son of Glenn) and Country Music Hall of Fame member Vince Gill to stun the crowd at the Classic East and West Festivals. They followed with seven more shows before the end of the year. Now, they have opened a tour that will see them play over 50 shows over the next six months from coast-to-coast with a setlist that starts and ends the same as their 2017 shows but mixes things up in the middle. Out is just one song, The Last Resort. In it's place are six new ones, "How Long", "Ol' '55", I Don't Want to Hear Anymore" and "Victim of Love" along with the James Gang's "Walk Away" and Vince Gills "Next Big Thing". They also gave plenty of spotlight to the new members of the band with Frey taking lead on four songs and Gill singing on six along with his own solo hit. In all, the show was 28 songs and two hours and 45 minutes long.